Weighing 138.7 carats, the Rosser Reeves Ruby is one of the world's largest and finest star rubies because it is not only clearer and more translucent that the Delong Star, but also possesses a sharp six-rayed star. 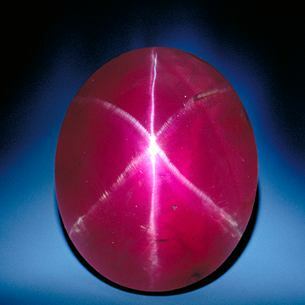 This Sri Lankan stone is renowned for its great color and well-defined star pattern. Advertising mogul Rosser Reeves, who donated the piece to the Smithsonian in 1965, carried it around as a lucky stone, referring to it as his baby. He often stated that he had acquired the stone at an auction in Istanbul in the mid-1950s. He actually bought the stone from Robert C. Nelson Jr. of New York who was acting on behalf of Firestone & Parson of Boston. Firestone & Parson were selling the stone for Mr. Paul Fisher of New York. Mr. Robert Fisher, Paul's father, had bought the ruby at an auction in London in 1953. At the time the ruby then weighed just over 140 carats, but was very heavily scratched, and a few carats were removed in the repolishing. The repolishing also helped to center the stone's star. Articles in the New York World-Telegram and The Sun in 1953 mentioned this fabulous gemstone. The glorious Midnight Star Ruby.